ABSOLUTELY GORGEOUS! Add all the chic charms & elegance to your beauty with this new High Quality Blue Pearls with Turquoise Stone Nugget accented in beautiful Necklace & earrings Set. The earrings in Nickle free french hook adds all prerequistions to it is beauty & an individual who wears this Jewerlry. A complete Jewelry FABLOUS PACKAGE! !Be the only one Gorgeous with this DAZZLING! 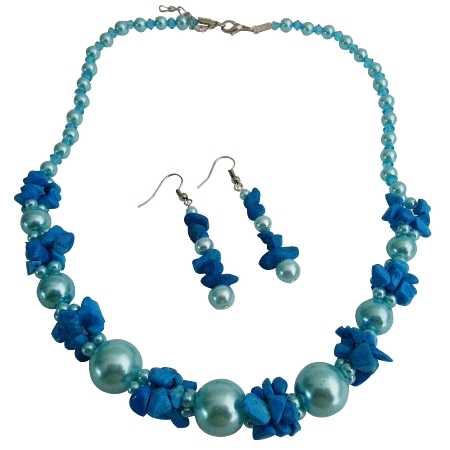 BLUE pearls Jewelry set for all the occasions! !.LUSH.PURCHASING The JEWELRY on the first looks! !.LOVE AT FIRST SIGHT.UNRESISTANT.